Matt Cardle makes a most welcome return to Sony Music on April 27th with the release of new album ‘Time To Be Alive’. Lead single ‘Desire’, an electronic, hook laden delight serves as the perfect introduction to Matt’s new sound. 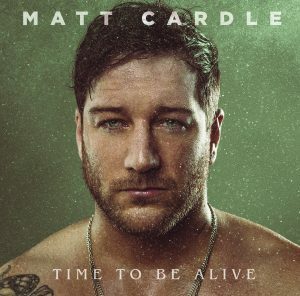 The striking record sees Cardle collaborate with Jim Eliot (Kylie, Will Young, Ellie Goulding) Christopher Elms (Bjork, Anohni, Alanis Morrisette) Dan McDougall (Liam Gallagher), Dimitri Tikovoi (MNEK, Goldfrapp) and James Hayto & James Jackman (George Michael). Matt has reinvented his sound on ‘Time To Be Alive’, fusing electronica, gospel, rock and soul. The lyrics are all personal observations on addiction, redemption, atonement and eventual contentment. It’s a collection that will surprise, and one Matt is incredibly proud of. All but one of the album’s 14 songs were co-written by Cardle. They reveal a portrait of an artist struggling with personal battles, but ultimately winning the war. Producer Jim Eliot was chosen by Matt to help him translate these intimate songs into an electronic, soulful album, which was primarily recorded at Jim’s Hay-on-Wye studio, and at Sarm Studios in London. ‘Time To Be Alive’ was mixed in Stockholm by Christopher Elms, best known for his work with Bjork. Early into the writing process, Matt spent six months in the lead role of West End hit musical ‘Memphis’. He received the Best West End Debut award from ‘What’s On Stage’ for his portrayal of Huey Calhoun. As the resounding winner of The X Factor’s highest rating series ever in 2010, over 19 million viewers tuned in to see Matt triumph with his breathtaking four- octave vocal range. Matt grew up on a steady diet of heavy metal (Rage Against the Machine, Korn) but also admits to a love of Katy Perry, Lady GaGa and the late Michael Jackson. His platinum-selling debut ‘Letters’ was released in 2011, followed by ‘The Fire’ (2012). Both albums went top ten while ‘Porcelain’ debuted at 11 driven by the Melanie C duet ‘Loving You’. Now back on Sony, ‘Time To Be Alive’, Matt’s 4th studio album, is his first LP release since ‘Porcelain’ in 2013 and showcases Matt’s new found maturity as a singer, songwriter and musician.